Why Do My Pupils Look Big? Pupil and Iris Problems - Why Do My Pupils Look Big? You look in the mirror and notice that the dark circles in the middle of your eyes are bigger than usual. What's going on? Those dark circles are your pupils, the openings that let light enter your eye so you can see. Muscles in the colored part of your eye, called the iris, control your pupil size. Your pupils get bigger or smaller, depending on the amount of light around you. In low light, your pupils open up, or dilate, to let in more light. When it’s bright, they get smaller, or constrict, to let in less light. Sometimes your pupils can dilate without any change in the light. The medical term for it is mydriasis. Medicines, injuries, and diseases can all cause this eye condition. These drugs affect the muscle that widens the pupil, slowing how it reacts to light. So even in a bright room, the eyes stay dilated. Withdrawal from these drugs can also make the pupils stay open wide. Pressure that builds inside your brain after a head injury, stroke, or tumor can damage the muscles in your iris that normally make your pupils open and close. One or both of your pupils can become fixed in the dilated position and can’t react to light. If that happens, you should see a doctor right away. If you've had a head injury, your doctor or nurse might shine a light into your eye during the exam to see if your pupils get smaller. An eye injury can damage nerves or the muscles in your iris that control your pupil size. That can also happen after eye surgery, such as cataract removal or corneal transplant. This condition means only one pupil is dilated. It's called "benign" because it's not related to any serious conditions, but it can sometimes affect young women who get migraines. The pupil usually goes back to normal size within a few hours, but it can last for several days. 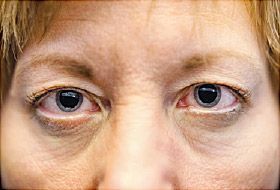 See your doctor or ophthalmologist for an exam if your pupils are enlarged and they don't get smaller in bright light. Get emergency help if you've had a head injury and your pupils look larger -- especially if one pupil is bigger than the other. The doctor will examine your eyes. You might also have imaging tests such as computed tomography (CT) or magnetic resonance imaging (MRI) scans to look for an injury or other problems in your brain. If a medicine caused your pupils to dilate, they should go back to normal once the drug wears off. Try to avoid the drug in the future, if you can. If you need the medication for a health problem, ask your doctor if there’s a different drug you can try that won’t affect your eyes. While your eyes are dilated, they will be more sensitive to light than usual. Try to avoid bright places. Wear sunglasses when you go outside. Sometimes dilated pupils can affect your vision. Ask your eye doctor if you need to avoid driving until your pupils go back to their normal size. American Academy of Ophthalmology: "Pharmacologic Dilation of Pupil," "What Can Cause A Fixed Pupil?" "What to Expect When Your Eyes Are Dilated." Benjamin, W., Borish, I. Borish's Clinical Refraction, Butterworth-Heinemann, 2006. Headway: the Brain Injury Association: "Treatment and Recovery." Lee, Andrew G., et al. Curbside Consultation in Neuro-ophthalmology: 49 Clinical Questions, Slack Inc., 2009. Mayo Clinic: "Traumatic brain injury: Tests and diagnosis." Moorfields Eye Hospital: "Anatomy of the eye." The Discovery Eye Foundation: "Pupils Respond to More Than Light." University of Illinois Extension: "Warning Signs and Symptoms of Common Illegal Drugs." University of Maryland School of Medicine: "Anticholinergic or Sympathomimetic."